Jimmy Cricket and fellow well-known entertainers have visited an exhibition which remembers the great work of legendary comedy writer Eddie Braben. Eddie, who died aged 82 in 2013, was an English writer and performer best known for providing material for Morecambe and Wise. He also worked for David Frost, Ronnie Corbett and Sir Ken Dodd. He was credited with changing the profile of Morecambe and Wise, helping to turn them into one of the most popular and enduring comedy acts in the history of British entertainment. Jimmy himself started working with Eddie on his TV show, And There’s More, in the 1980s and 90s, and then his radio show, Jimmy’s Cricket Show. 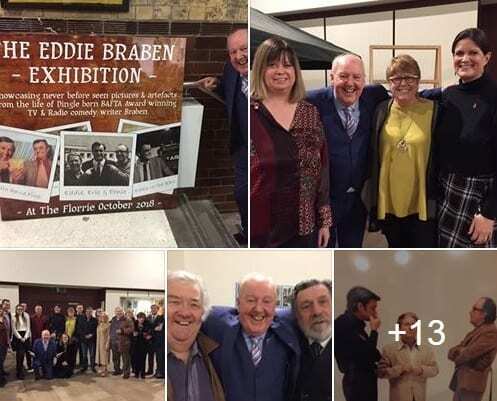 The exhibition on Eddie’s work at The Florrie, a stunning Grade II Victorian community heritage venue located in south Liverpool, opened on Wednesday 31 October for a fortnight. 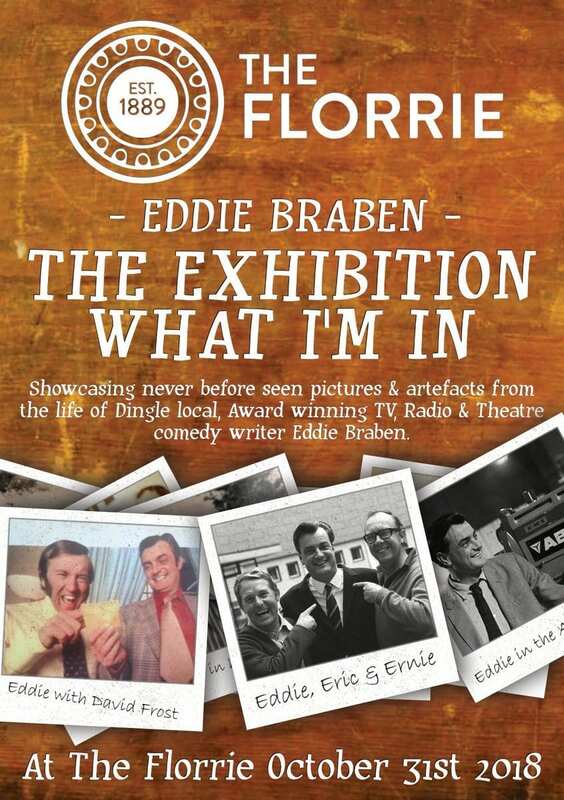 The Northern Irish entertainer described the exhibition as “a tribute to the genius writing of @eddie_braben“. What is Syd of Little and Large fame doing now? Jimmy Cricket devoted his latest monthly column in the Lancashire Evening Post to a man who was one half of a famous comedy double act. 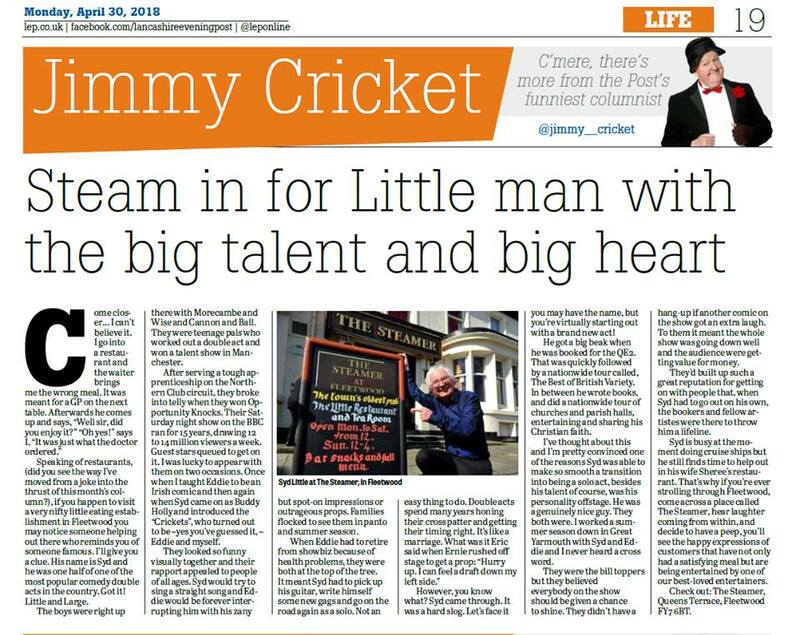 Well-known Northern Irish entertainer Jimmy talks in the 30 April edition of the Preston-based newspaper about Syd Little who formed a great show business partnership with Eddie Large. Syd was the straight man in the Little and Large act, while Eddie Large was generally the funny guy. They had a TV series and appeared in theatres and pantomimes for many years before they split when Eddie had serious health problems. Syd now performs on cruise ships, most notably on the QE2 (which was retired from active Cunard service on 27 November 2008), and also runs a restaurant in his hometown of Fleetwood in Lancashire called The Steamer with his wife Sheree. 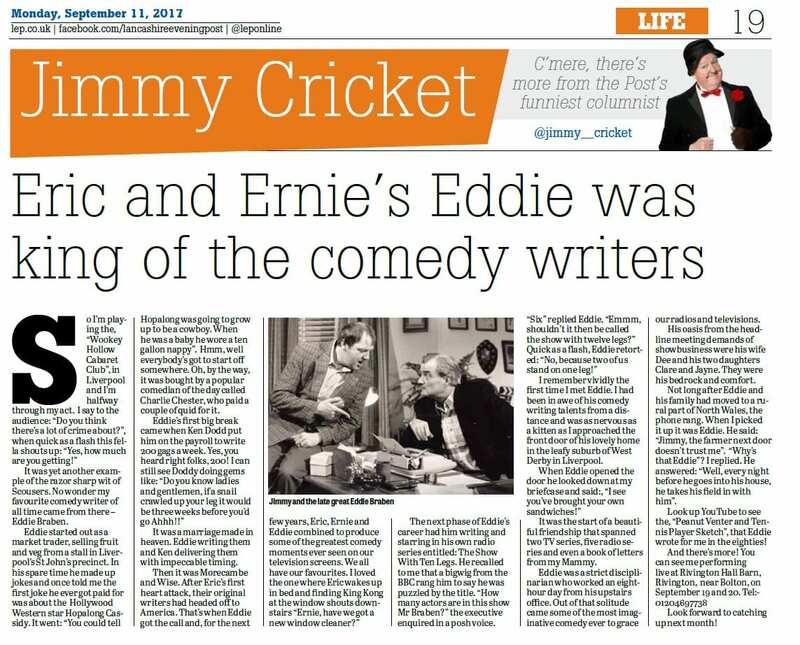 Jimmy Cricket remembers legendary comedy writer and close friend, the late Eddie Braben, in one of his recent newspaper columns. Edwin ‘Eddie’ Charles Braben was best known for providing material for Eric Morecambe and Ernie Wise. He also worked for David Frost, Ronnie Corbett and Ken Dodd. Belfast-born entertainer Jimmy, who has lived in Rochdale for many years, recalls in the Lancashire Post how Eddie started out as a market trader, selling fruit and veg from a stall in Liverpool’s St John precinct. In his spare time, he made up jokes. Northern Irish comedian Jimmy developed a lasting friendship with Eddie who sadly died aged 82 in May 2013. 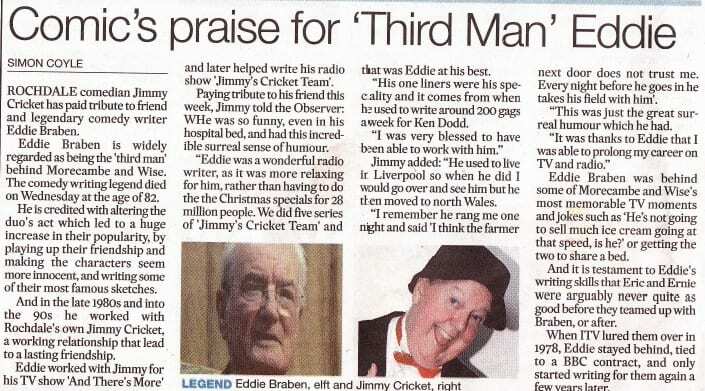 Below is a newspaper article in which Jimmy paid tribute to his old pal at the time. Jimmy Cricket has paid tribute to legendary comedy writer Eddie Braben who has died aged 82. Edwin ‘Eddie’ Charles Braben was an English writer and performer best known for providing material for Morecambe and Wise. He also worked for David Frost, Ronnie Corbett and Ken Dodd. Belfast-born entertainer Jimmy, who has lived in Rochdale for many years, started working with Eddie on his TV show, And There’s More, in the 1980s and 90s, and then his radio show, Jimmy’s Cricket Show. They developed a lasting friendship and Jimmy recalled: “He was so funny, even in his hospital bed, and had this incredible surreal sense of humour. A full tribute from Jimmy appeared in the Rochdale Observer (above is a copy of the article).